Aimovig is a brand name for a new human monoclonal antibody drug designed for the prevention of migraines. Previously known as AMG 334, it is categorized into the class of new drugs called selective calcitonin gene-related peptide (CGRP) antagonists, that are used for the management of acute migraine attacks. It is originally developed by pharmaceutical companies Novartis and Amgen. FDA accepted licence for erenumab application in July 2017. Novartis’ marketing authorisation (MA) application for this drug was accepted for review by the European Medicines Agency (EMA) in June 2017. Erenumab works by blocking the CGRP receptor. Calcitonin gene-related peptide (CGRP) is a proinflammatory vasodilating neuropeptide implicated in the pathophysiology of migraine, with early studies showing that CGRP levels increase in jugular venous blood during migraine attacks and are elevated interictally in the peripheral circulation in patients with episodic migraine and chronic migraine. By contrast, normal plasma CGRP levels were reported in chronic tension-type headache. The CGRP pathway is a promising target for migraine therapies. Studies of monoclonal antibodies as preventive therapy for migraine have shown potential with respect to efficacy and safety. 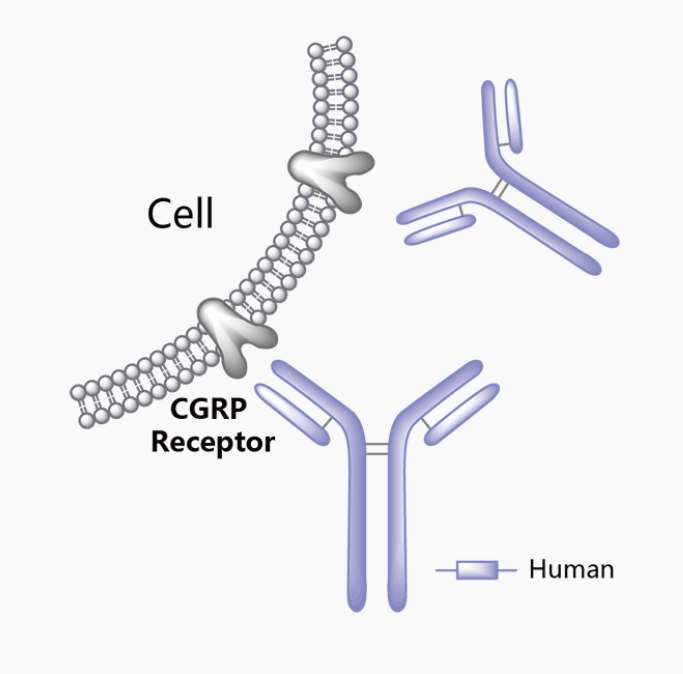 Erenumab is the only fully human monoclonal antibody that potently binds in a competitive and reversible manner to the CGRP receptor with greater selectivity than to other human calcitonin family receptors (eg, calcitonin, amylin, and adrenomedullin). The pharmacokinetic characteristics of erenumab are typical of monoclonal antibody therapeutics that exhibit target-mediated drug disposition. Furthermore, the erenumab concentration-dermal blood flow relationship indicates that erenumab is highly potent against peripheral CGRP receptors and that its pharmacological effect is sustained with repeated administration. Erenumab exhibits non-linear pharmacokinetics. Subcutaneous absorption half-life is 1.6 days and bioavailability is 74%. Erenumab shows maximum target engagement after single and repeated dosing, and has a long serum effective half-life at doses ≥70 mg subcutaneously. Erenumab concentrations needed for 50% or 99% of maximum inhibition are 255 ng/mL and 1134 ng/mL, respectively. Increased body weight supposed to be associated with increased erenumab elimination. What are the indications of Aimovig? The safety and efficacy results of erenumab 70 mg given subcutaneously every 4 weeks in a phase 2 study of patients with episodic migraine were reported in 2016. Preclinical studies dating back nearly three decades first suggested a role for calcitonin gene-related peptide (CGRP) in migraine. There has since been clinical substantiation, with proof-of-concept studies showing that monoclonal antibodies targeting the CGRP pathway have the potential to prevent migraines. Five phase 2 studies of monoclonal antibodies targeting the CGRP pathway were identified: eptinezumab (ALD403) in patients with frequent episodic migraine; remanezumab (TEV-48125) in patients with high-frequency episodic migraine and chronic migraine; galcanezumab (LY2951742) in patients with episodic migraine; and erenumab (AMG 334) in patients with episodic migraine. All studies contributed evidence for the role of CGRP in the pathogenesis of migraine, and all monoclonal antibodies investigated showed no significant adverse event or safety concerns and were seemingly well tolerated. A Phase II clinical study was conducted on 667 patients. Patients received either 70 mg or 140 mg of the drug (treatment group) or placebo (placebo group). This 12-week, randomized double-blind and placebo-controlled study made the primary endpoint of reducing the number of migraine days a month compared to placebo for both doses erenumab. For both doses, results showed a mean 6.6-day reduction of 18 migraine days a month, in comparison 4.2 days observed in the placebo group. The drug also exhibited a 50% reduction in the acute migraine-specific drug use days, headeache cumulative hours and good safety and tolerability. In a randomised, multi-centre, double-blind, placebo-controlled Phase III study called STRIVE that involved 955 patients, either subcutaneous erenumab in doses of 70 mg or 140 mg doses and placebo was administered to the patients on monthly basis for six months. Patients who received larger doses of erenumab had a 3.7-day reduction of monthly migraine days from the 8.3 days of baseline. It also exhibited a minimizing the migraine days by 50% in half of the patients, who administered 140 mg of erenumab versus placebo. With an average of 8.3 migraine days per month, participants had between four and 14 migraine days a month. Safety investigations showed that number of patients who had adverse events during erenumab use was similar between different doses of this drug. 95% of patients had adverse events that were mild or moderate in severity. Injection-site reactions were infrequent and all were mild in severity. Only two patients experienced serious adverse events during the double-blind treatment. One patient had a ruptured ovarian cyst and one had vertigo and migraine. 10% of patients had a post-baseline blood sample developed antidrug (binding) antibodies of which nine (3%) had neutralising antibodies. Adverse events leading to treatment discontinuation were transient ischaemic attack and herpes zoster, upper abdominal pain, conjunctivitis, temperature intolerance, headache in treatment group. Overall, no clinically significant finding in serum chemistry, haematology laboratory values, ECG parameters, or vital signs was recorded. One patient had an isolated aspartate aminotransferase increase greater than three times the upper limit of normal in the treatments with normal alanine aminotransferase and bilirubin. There was no evidence of any effect of erenumab on blood pressure.